The Domain Chevillon is the tale of men and women who have been developing the Domain through their own work since the 1900s. 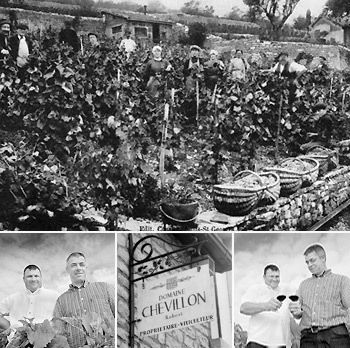 The adventure started with Symphorien Chevillon who started working approximately thirty acres of vines at Nuits-Saint-Georges in his own name. Then, Eugène-François (around 1914), following 2 years of military service and 5 years of war, took over the domain and bought a few plots as Premier Cru. In 1946, the vines were taken over by the 2 sons (they separated later on). Maurice bought 2 stills (39) and (46) and became an itinerant distiller. He continued to expand the Domain by buying new plots of Premier Cru. In 1937, his wife Adrienne gave birth to 2 children: Jeannine and Robert. In 1961, Robert married Christiane. They had 2 sons: Denis, born in 1963, and Bertrand, born in 1967. In 1990, Denis and Bertrand, together with their father, Robert, set up a partnership to create their own SCEV. Denis and Bertrand now manage the Domain, following Robert's retirement in 2003. The finesse and complexity of their wines are appreciated throughout the world: mainly in England and the United States, but also in Australia, South Africa, Japan, China and other countries that are opening up to the knowledge and "pleasure of wine enjoyment".